Every season there is at least one dish I make for the first time then repeat over and over again. What can I say? I'm a creature of habit. Once I find something I like, I see no problem with enjoying it multiple times, often in quick succession. My high school and college friends can attest; I ate the same lunch almost every day for a year at a time. This doesn't mean I don't like variety, and that's what's so beautiful about all the fresh Summer Salads you see here today. While the Grilled Calamari Salad Recipe we will share below was the clear winner, we enjoyed several other protein variations (with Shrimp and even Marinated Flank Steak) throughout the course of this summer season. 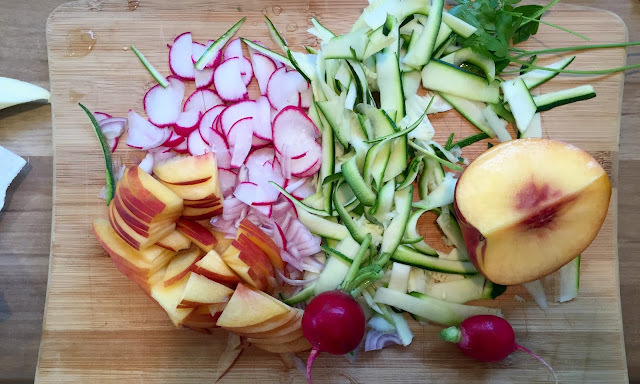 Turns out that almost any well cooked (ideally a little charred) grilled item tastes amazing over fresh, seasonal and, best of all ,colorful summer produce. So I know you're with me in declaring 2016 "The Summer of Salad." You see, I love vegetables. I love them as much or more than meat and fish, but that doesn't mean I want to have to choose. Creating easy yet elegant lunches and dinners using salad as a base is a great way to lighten up summer fare and highlight the best produce the season has to offer. Plus, if you're into the low carb thing, (no pasta?) this sure does the trick! Below you'll find plenty of ingredient inspiration for a few of our favorite summer lunch salads plus the recipe for the Simply Grilled, Marinated Calamari that starred in so many fantastic meals. 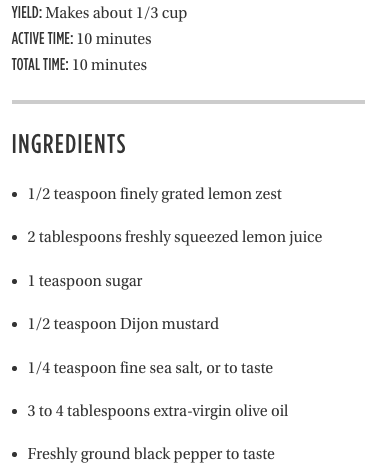 Note: All of the salads you see bleow are lightly dressed with a simple Lemon (or Orange) Vinaigrette (below). 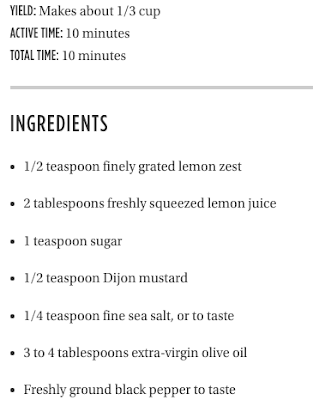 For the Orange variation just sub out all Lemon ingredients with Orange Juice and Zest in Equal Measure and add a drop or two of Vinegar to taste. Place Squid in a Ziploc Bag or airtight container. Add marinade ingredients and let sit in the fridge 30 minutes to a half hour. Place Squid on a hot grill pan and cook until golden in parts, a few minutes per side. Squid will be opaque, firm but not rubbery. Serve over Vinaigrette Dressed salad, plus a little Salt to taste, and enjoy! You don't have to eat poultry to enjoy Buffalo flavor. Turns out, Buffalo ANYTHING is pretty darn delicious - even humble Cauliflower becomes the life of the party when paired with America's favorite spicy sauce. In today's post, we give Calamari a really fun twist. Buffalo Calamari is a light seafood appetizer that is fun, super shareable and easy to execute in just ten minutes of active time. While I prefer to marinate the squid for about an hour in a bit in Oil, Lemon, Salt and Pepper, it's still good even if you don't have time for that. Grilling Calamari outdoors on a grill pan will prevent the tubes from slipping through the cracks. Alternately, you can boil Calamari on the stove just a few minutes until it is fully opaque and firm but not rubbery. Toss it in the sauce and you have a winning starter that guests will love. Enjoy and let's get to it. About an hour before you'd like to grill, add the cleaned Calamari to a large Ziploc Bag with the Olive Oil, Lemon Juice, and a few light shakes of Salt and Pepper. Allow to sit in the fridge for an hour. Preheat your grill until very hot with a thin Grill Pan suited for seafood on top of it. Grill Calamari about 3-4 minutes per side until golden in parts and opaque, but not rubbery. Remove Calamari to a cutting board to cool a bit. Once cooled, slice into 1/2 inch rings and leave small tentacles intact. Place in a mixing bowl. In a small saucepan, mix the Hot Sauce, 2 Tablespoons of Unsalted Butter and 1 Tablespoon Worcestershire Sauce. When the butter melts, mix into the Calamari and toss. Serve warm with your desired garnishes and enjoy!